One of the joys of my particular childhood was that where some kids get dragged out to the park or the common on a Sunday afternoon, we got drug to the SAS training ground at Pontrilas, just down the road from Hereford. I could scavenge the derelict buildings for the plasticine left over from the boys' plastic explosive training; sometimes I might even get to shoot a gun; and there were a Vampire jet fighter and a Canberra bomber, both there for the boys to practice blowing up. They obviously weren't very good at it, or else just shouted "BANG!" at the right moment because either way the planes were resolutely still there every time we visited. The Canberra was either sealed up or else the entrance was just too high up for a small boy to get into, but the Vampire was easily accessible so at a moment's notice I could become Scott Tracy or a fearless starfighter pilot or whatever I wanted. All brought back to mind by reading the wonderful Empire of the Clouds by James Hamilton-Paterson: an unashamedly boy-geek book about Britain's post-war aircraft industry, and why for a while we were producing the best (or at least most promising) aircraft in the world, and how it came to pass that nowadays we singularly don't. It was a different age. A plane could disintegrate at the Farnborough airshow, killing both pilots and 27 spectators, and the programme would carry on with the pilot of the next plane up simply being advised to keep to the right to avoid the wreckage on the runway. The test pilots of the Comet knew when they had hit a certain speed because the external skin flexed with a particular banging sound - only later did it occur to them that this might mean the construction was quite flimsy. The mustn't grumble/austerity way of life that had been perfected during WW2 carried on into peacetime and meant people could get away with risks and lifestyles that nowadays would get the entire fleet grounded. Unfortunately this attitude cut both ways, with the recommendations or outright pleas of experienced pilots being overruled by arrogant and complacent management who just expected them to get on with their job. The chief test pilot of Gloster, a decorated war hero and ipso facto one of the most important jet pilots in the world, was on a salary of £1500 - which translates to about £20k today. And the politicians really didn't help. For not very long in the fifties, but for just long enough to be truly suicidal, official policy was that the days of the fighter were over and from now on it was all guided missiles. The Fairey Delta, a truly world-beating fighter craft, was commissioned by the UK government, but new rules about supersonic overflight of populated areas meant it couldn't be tested in the UK. Also, the government refused to pay for damage caused by sonic bangs and no UK insurance company would touch the matter. So, the head of Dassault invited the Brits over to France to test the plane there, and also put them in touch with a French insurance company that would cover the entire test for £40. The Fairey Delta was to fall by the wayside while Dassault was to produce the highly successful Mirage - which looked astonishingly similar, but to be fair that's probably convergent evolution at work. To be even fairer the author tries to show both sides of the coin. The cancellation of the TSR.2 was something that still causes people of a certain generation to spit out bits of ground glass, and was part of a Night of the Long Knives defence cut by Denis Healey that closed down four projects and ultimately left the RAF having to borrow fighters off the navy. And yet, the book does give the other picture - the reasons why the projects had to be shut down, which might have been inevitable but not necessarily with the same crass insensitivity. I think much of what the book describes was inevitable. The WW2 culture of dozens of companies turning out dozens of designs was never going to last long - too expensive, too inefficient. As planes get faster and faster, face it, they do all start to look astonishingly similar, so the wonderfully varied Thunderbirds-type future of my childhood dreams was doomed from a very early age. This book is still required reading for what was, what might have been, and what wasn't. 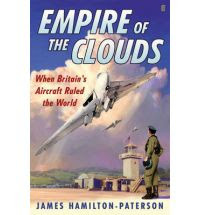 Also worth a look: ex-RAF Major Clanger's review of the same book that put me onto it in the first place. Particularly interesting to read the first paragraph as I live right next to the Pontrilas SAS training area and the security surrounding that place these days is pretty serious. Goes to show how times change.